The only trail to climb into the granite wonderland of the Castle Crags. 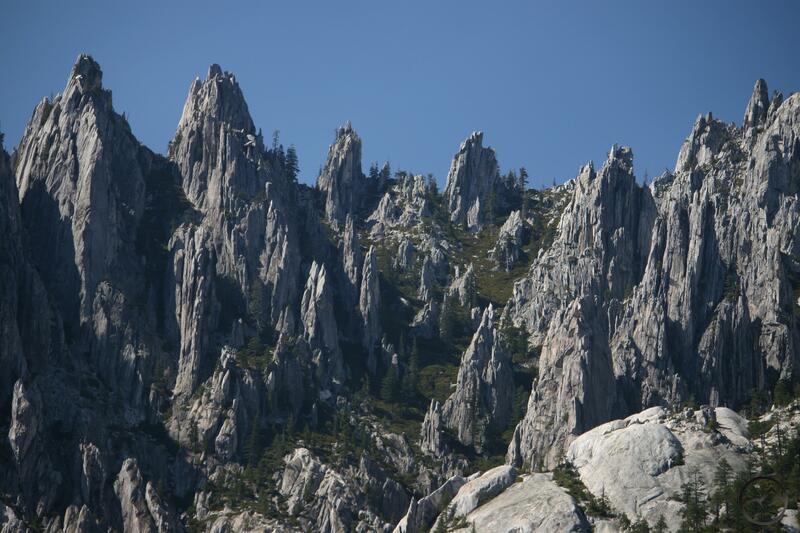 The Castle Crags are a frustratingly awesome formation to explore. The Crags are so rugged that there are no trails penetrating into the spire covered heart of the massive granite pluton. Although there are a few trails winding around the lower reaches of the Castle Crags, most notably the Pacific Crest Trail, all of these trails generally avoid those features that make the Crags the amazing spectacle that they are. The lone, if partial, exception to this state of affairs is the Castle Dome Trail (alternately referred to as the Castle Crags Trail or Crags Trail). This steep route climbs through the forested flanks before finally topping out on a brushy saddle slung between Castle Dome and the high towers of the Crag’s eastern face. 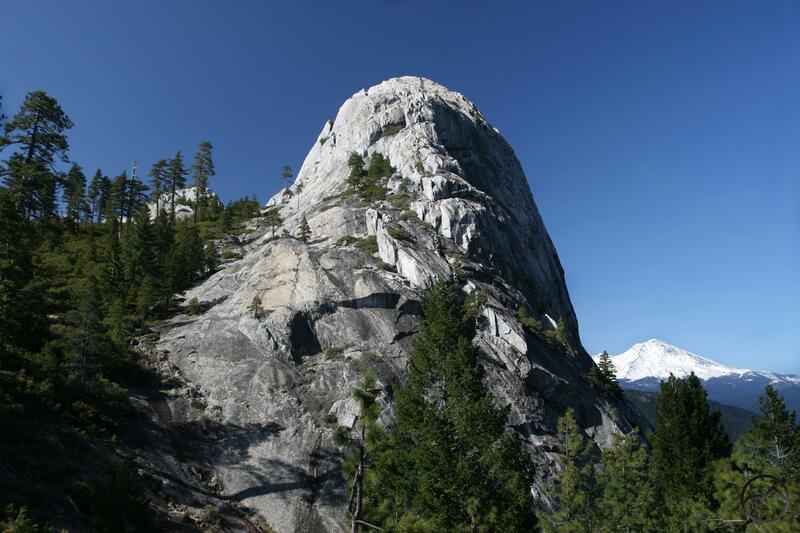 Although most of the trail is steep and utter lacking any interesting scenery, the final third of the trail is an exceptionally scenic ascent through granite pinnacles with amazing views of the Grey Rocks, Castle Dome and Mount Shasta. When the trail finally fades out at the saddle by Castle Dome it is not exactly in the bosom of the mighty crags but it is as close enough as one is going to get by means of a maintained trail. Still, it is an amazing destination with great views to the south of the mysterious Grey Rocks and the great towers of the Castle Crags soaring 1,000 feet overhead, foreboding in their inaccessible isolation. Over all of this presides lonely Mount Shasta, offering up one of its most classic profiles. While most of the Castle Dome Trail is steep and not particularly interesting, the payoff for the effort is immense and is well worth the effort. One special note is in order. 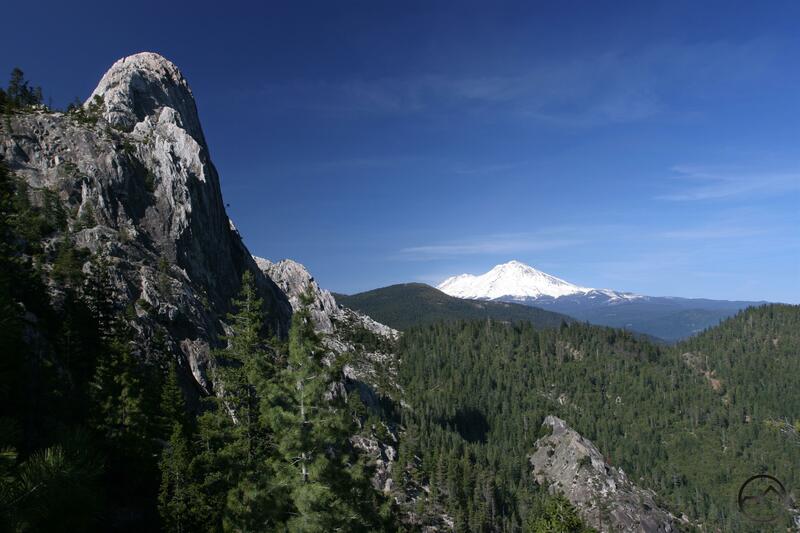 Along of all the trails in the Mount Shasta area, the Castle Dome Trail requires an entrance fee. This is because the trailhead is in Castle Crags State Park. 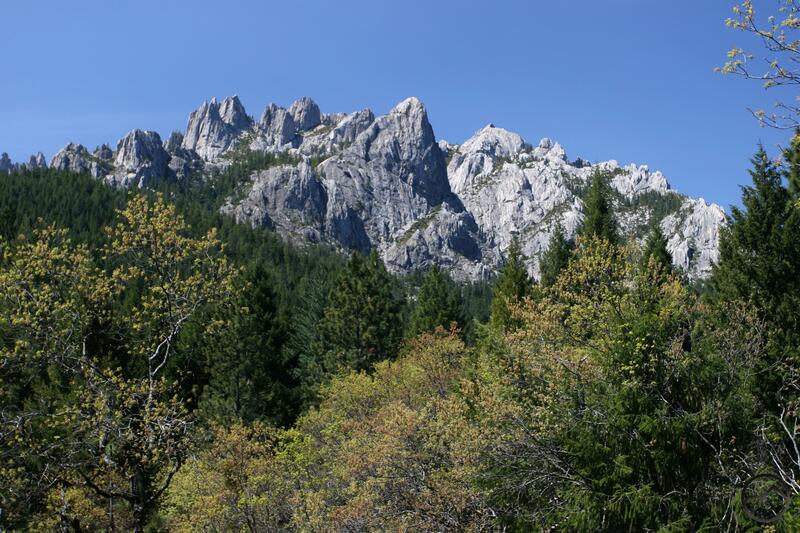 Ironically, none of what is recognizable as the Castle Crags is actually in the state park. 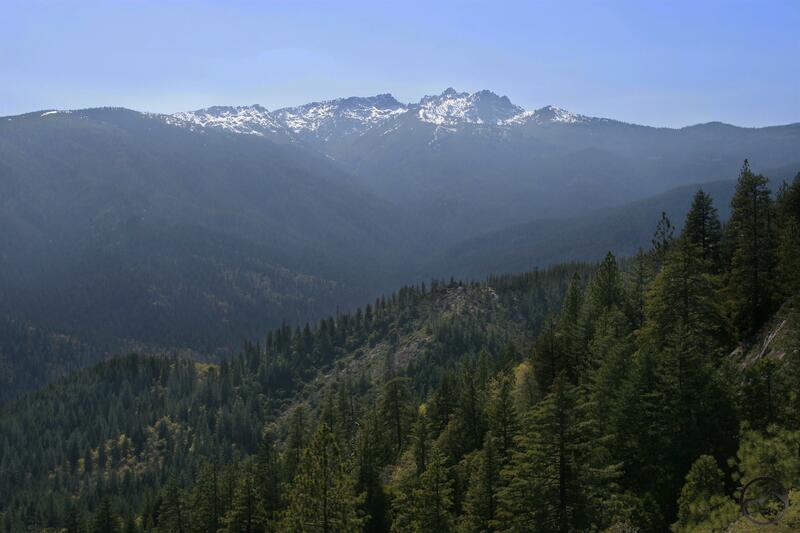 Instead it is in the Shasta-Trinity National Forest and is encompassed in the Castle Crags Wilderness. The state park essentially functions as a gate keep and assesses an entry fee to the national forest. It is a bit of an unfortunate scam. Castle Crags from the vista point. The Castle Dome Trail begins at the end of a windy, one lane road. The parking area has room for about 20 cars and has some picnic tables and a restroom. Before heading out on the main trail, it is a worthwhile warm up to walk the easy 0.25 mile path to a vista point. Though this adds 0.5 miles to the overall effort, the trail is ADA compatible and very, very easy. At the vista point, there is a great view of the Grey Rocks, the Castle Crags including Castle Dome and Mount Shasta. The point is made that these three formations all resulted from different processes. In particular, the three are formed from very different rock. 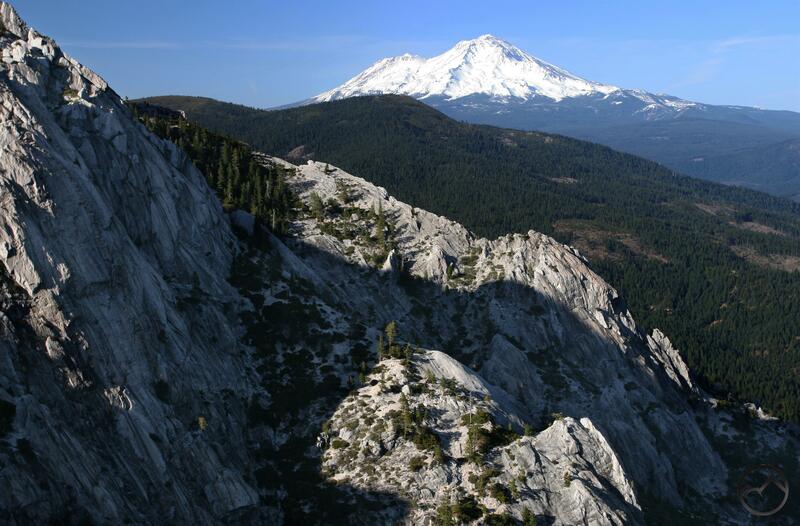 The Grey Rocks are composed of metamorphic greenstone, the Castle Crags from hardened and glaciated granite and Mount Shasta from volcanic andesite and dacite. In addition to having a great view of the surrounding region, the vista point also affords the opportunity to survey the route up to Castle Dome. Don’t worry; it is as steep as it looks. First view of the Castle Crags from the trail. When done enjoying the view of from the vista point, return to the parking lot and proceed down the paved road for about 100 yards to the beginning of the Castle Dome Trail. The trail maintains a very level, wide grade for the first 0.35 miles. This section of trail is shared with the Root Creek Trail, which is also ADA compatible (but only as far as the boundary between the state park and the national forest service wilderness boundary). After 0.3 miles, the Castle Dome splits left, off of the main trail. The easy grade of the first part of the trail is immediately forgotten and the route now climbs in sustained earnest. Initially it switchbacks a few times to gain elevation and then straightens out. Soon it passes through a clearing with power lines crackling overhead. Here it also crosses over the Pacific Crest Trail. 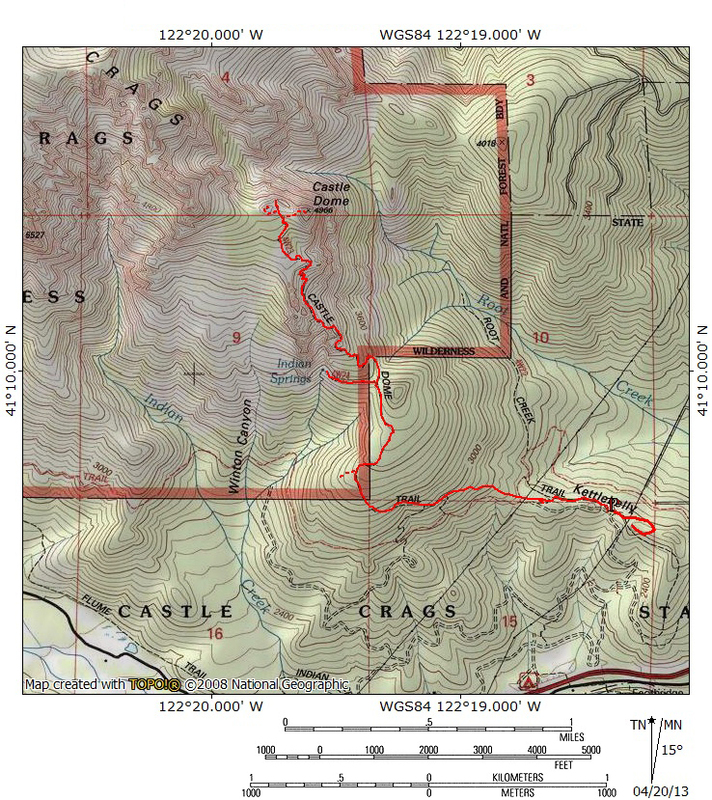 Most maps show the Castle Dome trail linking up with the PCT and heading west for a short distance before splitting off and using the Bob’s Hat Trail to connect to the actual location of the trail. This is in error. Instead, the trail crosses the PCT and begins to traverse the forested slopes above the PCT, climbing higher toward the junction with the Bob’s Hat Trail. After the junction, the maps are again accurate. Here the trail begins a sustained northward climb through thick forest. After 0.2 miles of climbing the trail reaches a switchback and begins heading east. Right at the switchback, a small clearing is visible about 30 yards away. From the clearing, which is used as a small, waterless campsite, there is the first good opportunity to gaze up at the mighty Castle Crags. The countless granite spires are astounding. The Grey Rocks and Castle Creek seen from the Indian Springs Trail. Back on the trail, it turns to north again, shortly after the lone switchback. It continues to climb, though for the first time the grade lessens. Note that tufts of grass begin to appear on the forest floor. As the path climbs it begins to level off and the grass becomes a thicker mat on the forest floor. Shortly after this the trail finally breaks out of the forest and levels off completely. 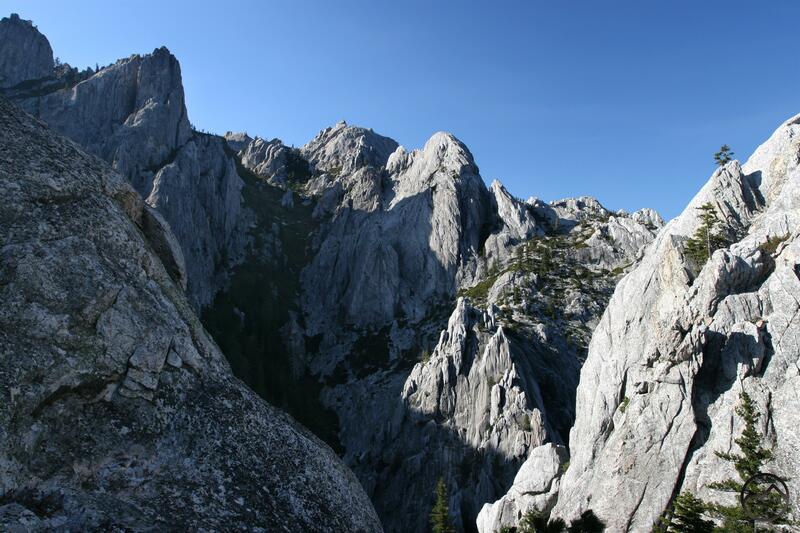 It traverses the south side of a slope but has good views of the Grey Rocks and some of the Castle Crags. In particular the south side of Six-Toe Rock is visible. This is one of the most popular rock climbing destinations in the Crags. Too soon, the level section of trail comes to an end at a junction with a spur leading to Indian Spring. Though it is 0.2 miles each way on the spur trail, it is a worth the extra effort. There are more good views of Six-Toe Rock, the Grey Rocks and Castle Creek. If one is short on water, the side trip is mandatory, as it is the only water on the entire trail. The small spring gushing out of the rocks has created a verdant little grotto. It is a refreshingly cool place to take a rest before beginning the final push up to Castle Dome. Castle Dome and Mount Shasta from the wilderness boundary. Returning to the junction with the Castle Dome Trail, the path begins once again to climb. A short distance away the trail finally departs Castle Crags State Park and enters the Castle Crags Wilderness, which is administered by the national forest. Near the wilderness sign, the trail affords its most iconic view: Castle Dome towers overhead on the left while far to the north presides Mount Shasta, the mightiest peak in Northern California (honestly, it is the grandest single peak in all of California, no disrespect to the glorious Sierra Nevada intended). The route soon turns away from the vista and climbs through forest canopy just a little more before finally passing through a series of granite pinnacles. At last the trail finally feels like it is worth it. Weaving around the small towers and along narrow benches beneath high granite walls, the trail has entered the granite portion of the Crags. It the grade gets steeper and switchbacks a few more times. Now Castle Dome is in constant sight, as is Mount Shasta. After passing a small, watery seep, the trail finally comes to an open point with great views. 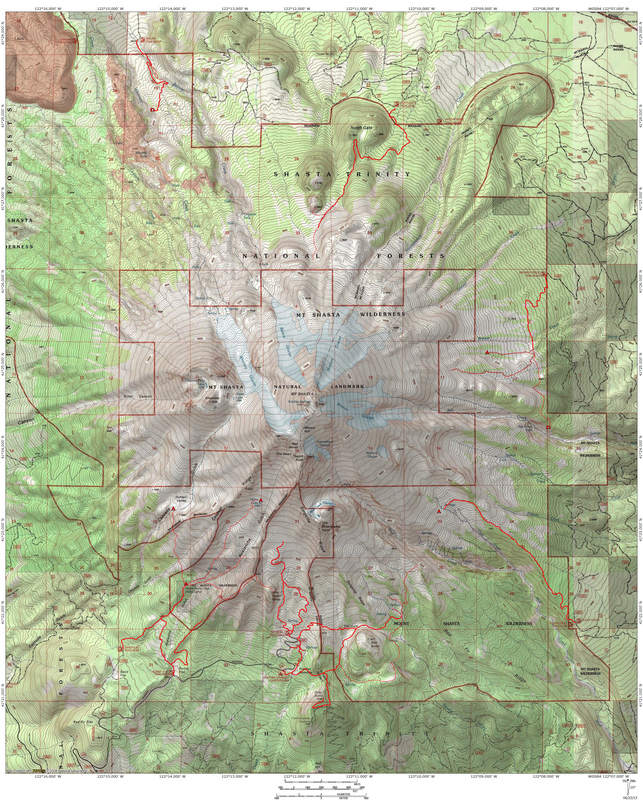 The forest cover is diminished here, not to return while on the saddle by Castle Dome. From the unforested point the trail climbs a little higher, plunging into deep manzanita. It winds through the brush before finally ending at a notch high above Root Creek Canyon, which is on the far side of the Castle Dome saddle. Granite spires seen from the notch at trail’s end. The saddle is a pretty awesome location. There are fine views of the Sacramento River Canyon as well as the Castle Creek drainage which is topped by the Grey Rocks. Castle Dome rises above the saddle on the east side and a cluster of smaller domes line the north edge of the saddle. The other side of these domes sees an 800 foot drop down into Root Creek Canyon. On the south side of the saddle is the low summit of Six-Toe Rock. The rock is far more impressive when looking at it from below. On the saddle it fails to impress. On the far side of the saddle are the high towers of the Castle Crags, a seemingly endless maze of granite spires and pinnacles. Not trails penetrate this area and it remains one of the most remote and inaccessible wildernesses in Northern California, despite its close proximity to the freeway and the Castle Dome Trail. From the notch overlooking upper Root Creek Canyon, which marks the terminus of the maintained trail, there is a rough use trail that plows through the brush across the saddle to the base of the cliffs. 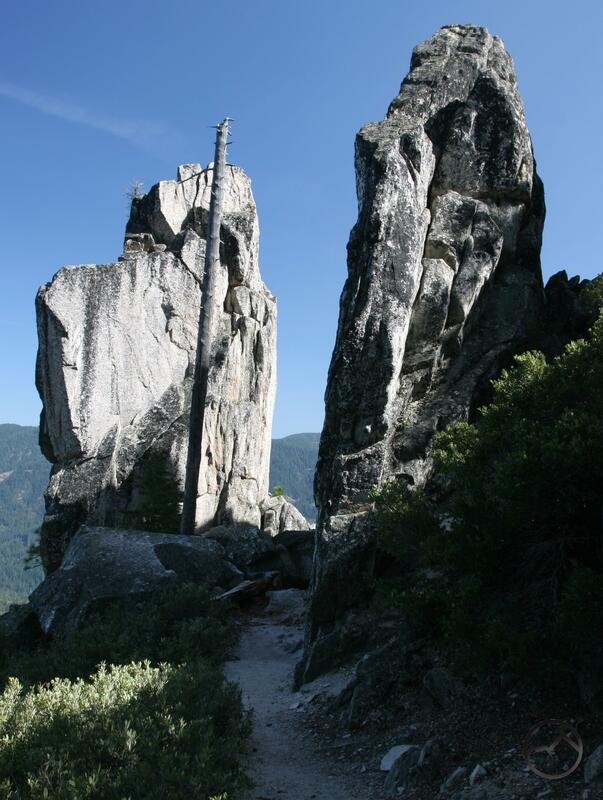 This is used by climbers to reach the foot of Mount Hubris, one of the more conspicuous towers in this portion of the Castle Crags. There are many excellent climbing routes on Mount Hubris but the most notable of these is the famed Cosmic Wall. Mount Shasta seen from the Observation Deck. Even though the trail is dubbed the Castle Dome Trail, it does not lead to the summit of Castle Dome. Instead, the trail ends near the base of the dome. It is possible to reach the summit without any technical rock climbing experience. However, there is some very dangerous exposure and should not be undertaken without good scrambling skills and sound judgment. The route scales the south side of the dome. There is little exposure for the first 75% of the climb. It is the last portion that the danger increases significantly. If climbing the dome is not in the plans, there are other options for a fitting climax to the hike. The most notable of these is the cluster of small domes immediately to the west of Castle Dome. The dome that forms the left side of the notch at trail’s end is called the Observation Deck. From the end of the trail, skirt the base of the dome to the south side. There is some brush but hugging the rock makes the short jaunt pretty easy. There is also a use trail from further down on the Castle Dome Trail that also accesses the back side of the Deck. It is an easy scramble to the top. From up on the Observation Deck, there are great views in all directions, taking in the Crags, Castle Dome and Mount Shasta. Savor the view of this majestic land. Castle Dome Trail passes through granite pinnacles. From the Castella exit on I-5, proceed a few hundred yards west on Castle Creek Road to the entrance to the State Park. Turn right into the park entrance and pay the $8.00 at the guard station. Turn right immediately after the guard station and continue through the campground. Just beyond the campground there is a turnaround. Use the turnaround if your vehicle does not have a tight steering radius. From here it is a little over a mile up a winding, one lane road to the trailhead. The park is open from 6AM to 8PM. There is no overnight parking at the trailhead. Des Castle Crags accept golden age or g olden access passes? Neither is needed at Castle Lake. Sorry misread that on my phone (down in Yosemite now). Castle Crags is a state pRk and does not honor any federal passes. No. $8 per car for day pass. Are dogs allowed on the Crags Trail? Dogs are not allowed on any trails in Castle Crags State Park. Thanks for this write up. Can you speak to how safe/accessible this trail would be for small kids? We have a 6 year old who is a pretty good hiker stamina-wise, but I don’t want him falling off a cliff! We also have a 3 year old, but she can ride in a back pack for any tricky parts. Been there. Majestic. Inspiring. Thrilling. So, I don’t understand your calling an entrance fee for the privilege of entering such an area “a bit of an unfortunate scam”. I see that you too spent a great deal of time hiking the trails, soaking in the energy, and enjoying the spectacular sights. All the adjectives you used certainly apply to the Castle Crags and I don’t mind paying entrance fees when they are appropriate. What I do mind is when the state park has almost none of the Castle Crags in it and they are effectively playing gatekeeper to a federal wilderness area. If I had my druthers, the state park would turn the land over to the forest service and the size of the wilderness area correspondingly increased.